Johnny Manziel has turned himself in to authorities in Texas one day before his slated court hearing as he was booked for misdemeanor assault in his domestic violence case by a grand jury. The ex-NFL star was seen sniggering during his mugshot, which was released by police today in Highland Park, Dallas. He was released on $1,500 bond -- and is scheduled to be arraigned on Thursday morning in Dallas. The quarterback is accused of beating up his ex-girlfriend, Colleen Crowley, back in January. She filed a restraining order against him claiming that he ruptured her eardrum and that she was in fear for her life. If convicted on the assault charge, Manziel faces A class misdemeanour - meaning he might face imprisonment for a year and a fine of 4000 dollars. 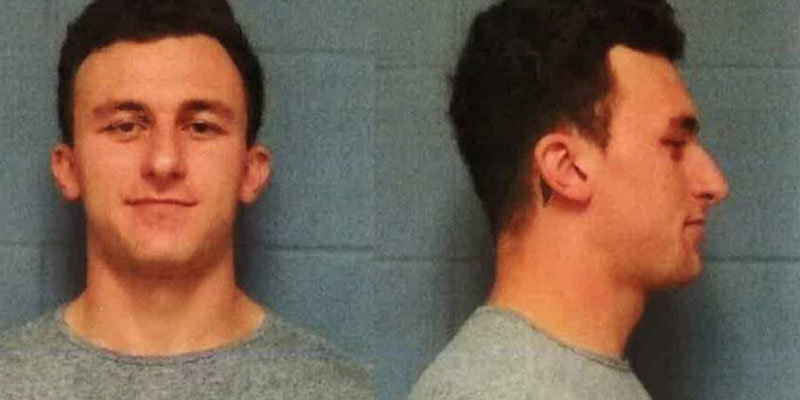 According to reports, Manziel wasn't in the station for very long and was very polite and cooperative. 'Johnny will certainly plead 'not guilty' and we believe the evidence will support that plea. Out of respect for Ms. Colleen Crowley, we will not try the case in the press. We do, however, believe that Johnny will be acquitted at the conclusion of the case.' said the athlete's lead counsel, Jim Darnell.